I’m a stranger here. Tired, sweaty and hungry. I’ve been walking for hours: along the riverfront, up and down the streets of the French Quarter. If I knock back an eight-dollar jumbo margarita in a styrofoam cup, it’s because I’m justifiably thirsty. I take up residence on a bench outside the Café du Monde. My tipsy imagination should now, by all rights, drift to Tennessee Williams–all ‘kindness of strangers’ and ‘gentlemen callers’–but it does not. 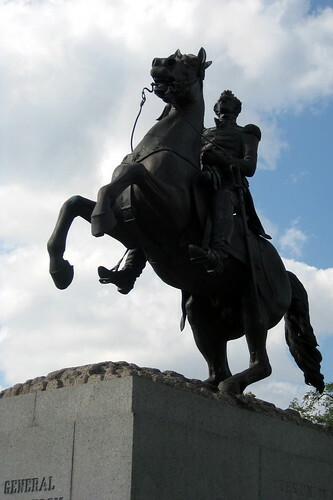 Across the street from the Café du Monde stands an impressive statue of Andrew Jackson, astride a rearing horse. Would you believe that I sat under the gaze of General Jackson and contemplated the Battle of New Orleans? Monuments may aim to remind us of historical events, but art has a life of its own. And for me, art conjures more art. That’s how I was moved, association by association, from Mr. Jackson to Peter the Great. And then (bear with me), forward to modern-day New Orleans. As you may know, there is an equestrian statue of Peter the Great in St.Petersburg that quickly became (and has remained) an essential symbol of that city. It’s only fair; Petersburg was his fond creation: Window to the West, and all that jazz. Next, it’s less likely that you are familiar with The Bronze Horseman, Alexander Pushkin’s equally monumental narrative poem starring this very statue. You will have to trust me when I say that one cannot remember the statue of Peter without recalling Alexander’s poem. Evgeny, a hapless clerk (and beloved type of the Russian literary tradition), falls victim to the notorious (and very real) 1824 flood that devastated the city. As the waters recede, he rushes to the modest home of his beloved, Parasha. It is utterly destroyed, and Parasha is nowhere to be found. She is, no doubt, (here, I take a few liberties with the text) at the Superdome, or worse. Evgeny never recovers from the blow. 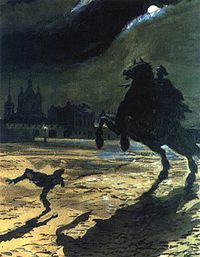 In the final episode of the poem, he angrily curses Peter’s bronze equestrian form, whereupon the statue comes to life and chases him to his death. Leveled or ruined or abolished. I’m having fun here, of course, swinging back and forth in time and place, but for a purpose. These gorgeous, impractical cities were both built on swamps and barely above sea level. It’s too late now to decide that we oughtn’t build in such places; the cities are treasures, both of them; we can’t abandon them. Peter and Andrew will always be safe atop their horses. The next time the winds blow and the waters rise, can’t we do better for Evgeny and Parasha?